Today, Amplify Partners, Redpoint Ventures, and the Cloud Native Computing Foundation are proud to announce the Cloud Native Landscape. 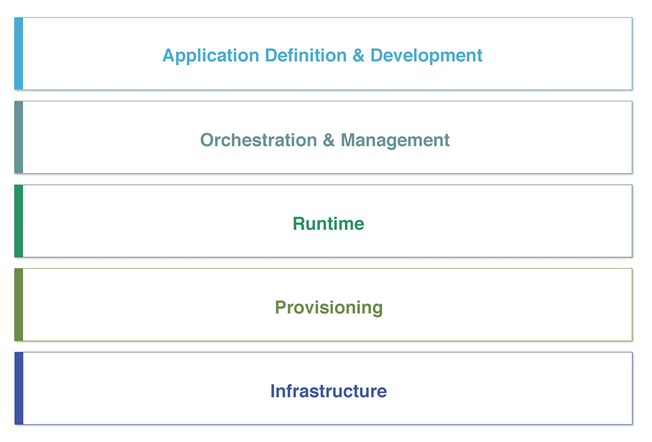 This project leverages the CNCF’s newly-announced reference architecture (below) to segment the stack and identify the prevailing projects, products and companies that enable organizations to build, test, deploy and scale cloud native applications. The goal, ultimately, is to provide clarity as to how different projects and companies fit together and to help ground the conversation for customers, practitioners and analysts as they embark on their cloud native journeys. In the last decade, we’ve witnessed the emergence of a new computing paradigm characterized by open, elastic infrastructure, microservices application architectures and DevOps development and deployment principles. These massive deflationary forces have eviscerated barriers to adoption, distribution and innovation for technology. Correspondingly, there has been a Cambrian explosion of new projects, products and companies while yesterday’s tech giants — minted in the client/server era — have seen their businesses come under pressure from the commoditizing power of open source and cloud. The practical implication is that every organization is in the midst of a massive digital transformation where IT shifts from a cost center that is adjunct to core business to a profit center that is its lifeblood. Competitive advantage in this world is defined by a company’s ability to out-innovate its rivals, which most plainly translates into the ability to write better software faster. Cloud native was a catchall term created to represent this new computing paradigm, one that is optimized for modern distributed systems capable of scaling to tens of thousands of self-healing multi-tenant nodes. It is informed by technical merit and end-user value, and inspired by Internet-scale computing born inside organizations like Google and Facebook. If this sounds nebulous, it’s because it is. For the last several years, as the velocity of innovation has accelerated to breakneck speed, so too has confusion for end-users. Orchestration, scheduling, distributed coordination, service discovery? Suddenly a new computing vocabulary had emerged, but no clear taxonomy or reference guide existed to help customers along their path to become cloud-natives. At Amplify, we have been closely observing the radical innovation unfolding, remarking these changes were fundamental and would reshape and recast the entire IT value chain. Last year we began to map out the ecosystem, and as those efforts continued in 2016, we got in touch with Dan Kohn and Alexis Richardson of the Cloud Native Computing Foundation, which itself was in the midst of defining and voting on a reference architecture. Over the course of a few conversations it became evident that collaborating on a definitive industry landscape would benefit the entire ecosystem — from individual developers to customers to startups to large incumbents — which ultimately brought us to today. Please note that this version 0.9 is a beta, and we will be working towards a 1.0 release in the coming months that will incorporate a more nuanced architecture and segmentation and feature more projects and companies which may be absent in the current version. The beta version is available at https://github.com/cncf/landscape and we’re eager to accept feedback. We encourage projects and companies that have not been highlighted in the current release to open an issue so they can be included in version 1.0. This post originally appeared on the blog Memory Leak by Lenny Pruss.